The option should be activated easily, then scanned JPEGs are automatically deleted or cleaned up when the program is closed! 1.) ... Understand the temporary scan folder! 2.) ... Tip: Open the scanned image in the folder or edit! See also: PDF from screen capture or other images? 1.) Understand the temporary scan folder! 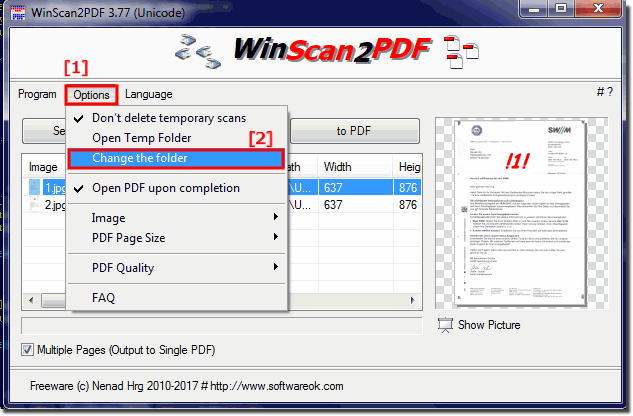 "Do not delete temporary scans"
Please use ... always the latest version of WinScan2PDF. (Image-1) Auto clean up scanned JPEGs at Program end! As you can see above in Windows 10 shot screenshot, you can decide whether scanned images should be deleted automatically, this example is not only for Win 10, it can automatically delete scanned images even with older versions. It also does not matter whether it is using a Windows desktop PC on the home PC or scanning it on the tablet / Surface Pro / Go, or even on a MS Server operating system or in public authorities. It was tested on various MS operating systems and successfully verified. (Image-2) Change the default location for scanned PDF documents! 2.) Tip: Open the scanned image in the folder or edit! If you have been using WinScan2PDF for quite some time now, you are glad if you show the picture in WinScan2PDF, then the display program in Windows automatically opens. Since the scan files often have lines of letter creases or ink splashes visible, they are often cleaned by Paint.net or MS-Paint. Previously, the file was accessed via the menu item: Options> Open temporary folder> right-click the file and then open with. (Image-3) Open the scanned images in the folder or edit before create PDF! 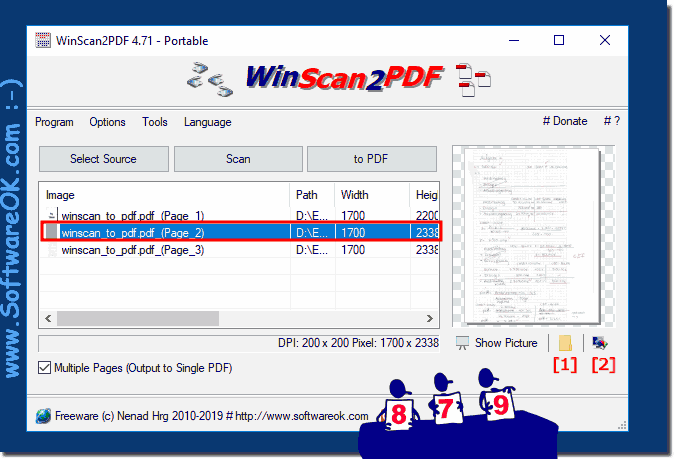 WinScan2PDF - FAQ-19: How to automatically clean up scanned JPEGs when end the Program?